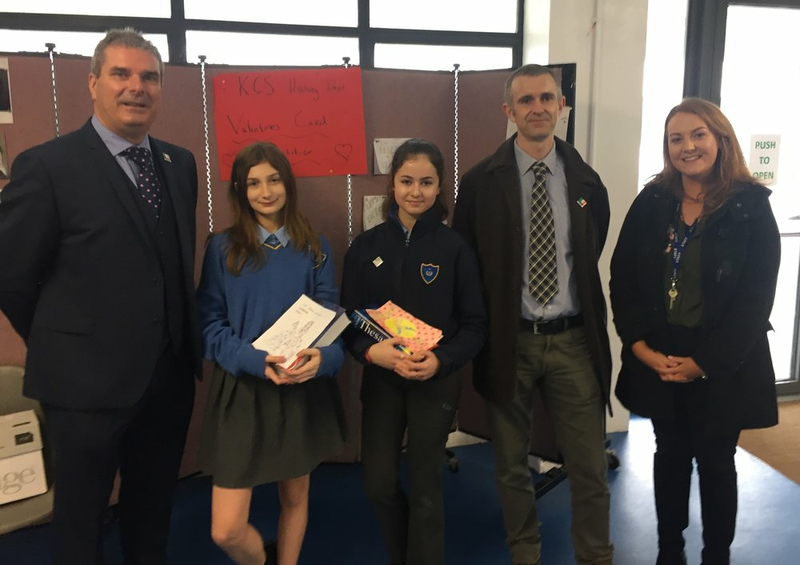 As part of History Week, we awarded the winners of the KCS History Valentines Card competition. This competition allowed students to combine a love of art, history and humour as they created beautiful drawings and clever puns; as well as celebrating historic events and figures! Thank you to Ms Kennedy for organising the event. Another aspect of History Week is celebrating all of our students' history; learning about other countries and cultures is so important and this display allowed students to celebrate and commemorate their own personal histories. Also pictured are posters from Ms Dunne's and Ms Kennedy's classes. Getting teachers involved is just as important with our guess who game! Investigating old photos to see just which teacher dug up their old baby photo! Thank you to all staff members for supporting us during History Week. The Irish departments for collaborating for the flag raising ceremony, as well as the Music Department for playing so beautifully.